Passing through the black-and-white gate, enter a plant-lover's haven in a part-walled garden, with bulbs and shady woodlanders in spring, and a plethora of herbaceous plants and climbers. Many of the plants on sale are grown from seed. Also open for NGS and by arrangement. 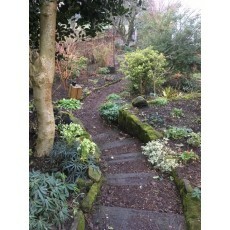 The garden slopes and has steps so wheelchair access is limited. Half a mile south of Stafford town centre off the A449. Turn through large brick gate-posts into a private park. St John's Road is wide but please park considerately.